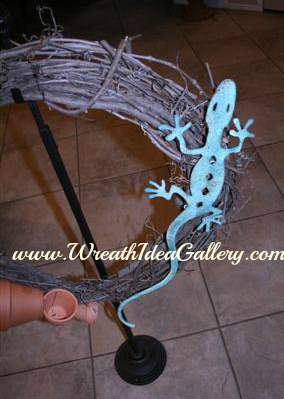 Accent piece- I used a metal lizard. 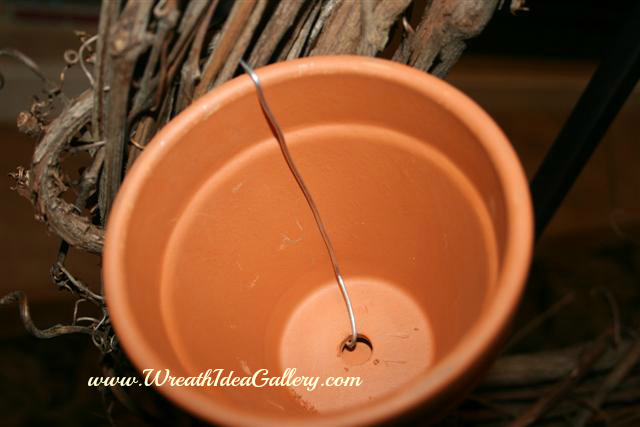 I started by taking a piece of wire, then molding it to the pot through the hole and making sure you leave enough wire to wrap around the back of the wreath. Then you will need to twist to secure. 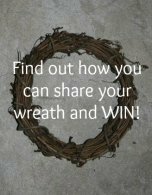 Make sure you poke the ends of the wire back into the grapevine so they do not scratch the surface that you hang your wreath against. 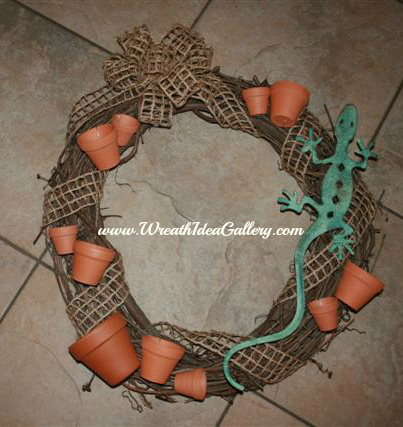 I used a metal lizard for an accent and placed him on the right side of the wreath. I secured him with fuzzy sticks. Add the pots in groups and at a little angle. Make sure they are upright enough to hold your plant. Some of the smaller ones can be sideways and can just be there for decoration do not need to plant in them. 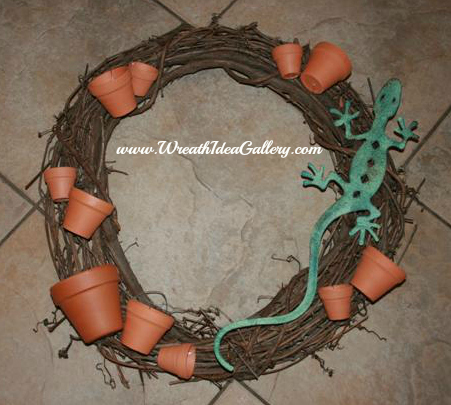 I found this wired edge twine looking ribbon that I made a bow for the top and then wrapped the wreath between the pots and lizard. 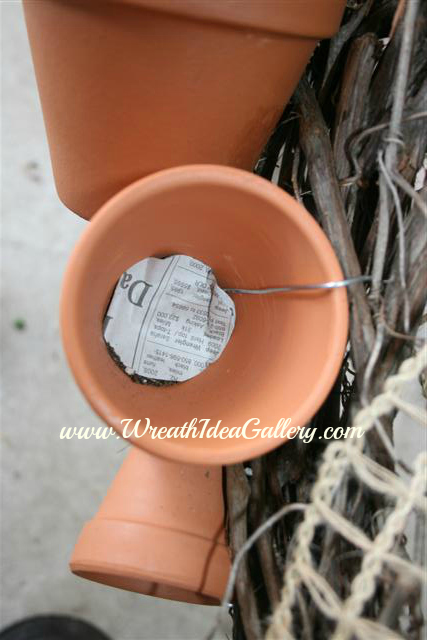 So the dirt would not fall out of the pot you can put some newspaper or gardening fabric. 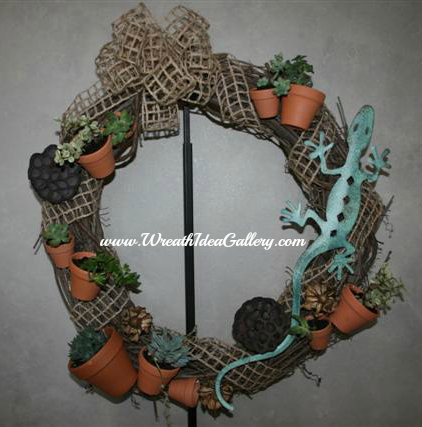 Any Succulent wreaths you would like to share? Please we would love to see! I bought a variety of succulents and planted them in the pots using succulent dirt you can get from local garden store. I added some dried pods and dried flowers to add some more texture and fill in some of the spaces. 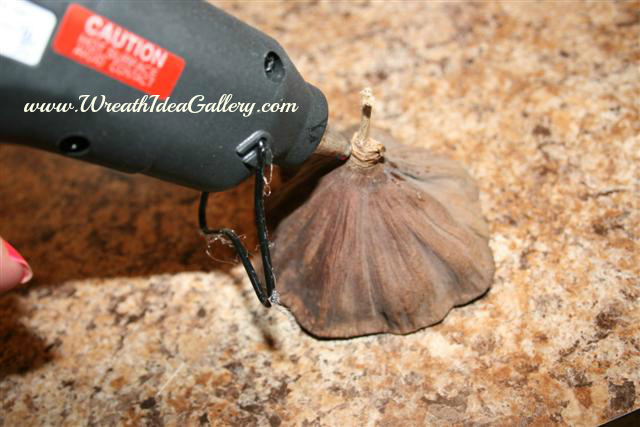 I attached them with hot glue. And that is all there is to it ready to hang. 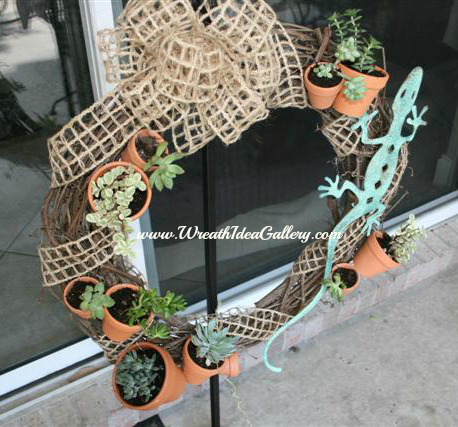 You will want to hang in a sunny spot and make sure you take care of your succulents.